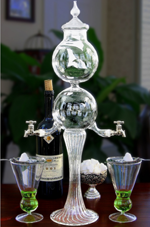 Absinthe Fountain Sets are the best way to purchase everything you need for an incredible absinthe party at one low price. Complete sets will include the fountain, glasses, spoons, sugar cubes and instructions on preparing your absinthe. Save money by purchasing your absinthe set at the discounted package price. Everything you need for your Belle Epoque themed Absinthe celebration in one box gives you the perfect "L'heure verte" or Green Hour. 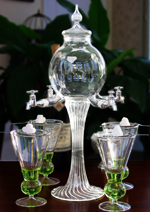 "Absinthe Fountain Sets give you everything you need for an absinthe party at one low price"
All you'll need is an absinthe vendor and we can help you with that too! Below you will find the most popular absinthe sets available. 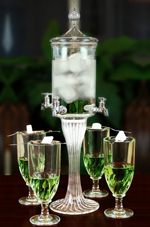 The 4 Spout Rozier Absinthe Fountain Set is the Green Fairies absolute favorite. Beautifully made from crystal, borosilicate glass, it is mouth-blown with a most unique serrated base and decorative top. Truly stunning. Our Lady Wings 4 or 6 Spout Fountain is a breathtaking piece in the grand style of the Belle Epoque. Completely hand crafted, it is truly keepsake quality. Removable, padded cushion in base protects furniture. Set includes 4 glasses, 4 spoons, sugar bowl, sugar cubes and illustrated instructions for preparing your absinthe. 24" tall, 12 inches spouts to table. Bowl holds 2.1 liters. 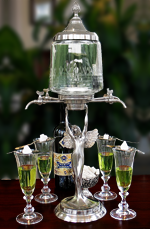 Enjoy the Green Fairy with the mouth blown, Deluxe 4 Spout Absinthe Fountain Set. Includes a gorgeous 4 faucet, mouth-blown Absinthe fountain made from crystal, borosilicate glass. Base and top have a unique serrated design. Imported from Germany. 19 in. tall with top, 8.5 in. table to spouts, holds 1.5 litre. Includes 4 absinthe glasses, 4 spoons, sugar bowl, sugar cubes and illustrated instructions for preparing your absinthe. 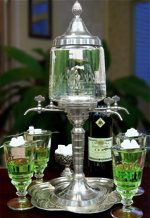 The Bistro 4 spout Absinthe Fountain set is a replica of those used during the Belle Epoque. All metal pieces are hand cast, turned and molded lending it a beautifully antique look. Thick glass bowl is mouth blown with intricately cut design. 21" tall, 9 inches spouts to table. Bowl holds 2.1 liters. Set includes 4 glasses, 4 absinthe spoons, sugar bowl, sugar cubes and instructions for preparing your absinthe. The Aquitaine absinthe fountain is designed to have it's bottom bowl filled with water and the top, ice. As the ice melts, it keeps the bottom bowl cold. Beautiful serrated design base. Made entirely from crystal, borosilicate glass. 21 in with top, 8 in table to spouts, holds 1800 ml (900 ml x 2). Set include 2 glasses, 2 absinthe spoons, sugar bowl, sugar cubes and complete instructions for preparing your absinthe. 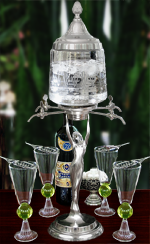 The Lady 4 Spout Absinthe Fountain Set relives the grand style of the Belle Epoque. Completely hand crafted, it is truly keepsake quality. All metal construction. Removable, padded cushion in base protects furniture. Includes 4 glasses, 4 spoons, sugar bowl, sugar cubes and illustrated instructions for preparing your absinthe. 24" tall, 12 inches spouts to table. Bowl holds 2.1 liters. To start, always avoid Amazon and Ebay. They are notorious for selling poor quality absinthe fountains. These sellers purchase what is known as "B Stock" products from manufacturers and sell them as new. B stock is product nobody wants due to defects and lack of quality control. If you do buy from Amazon or Ebay, inspect your metal fountain for unlevel glass bowls and peeling nickel plate. Inspect your glass fountains for unsymmetrical spigot placement and hazy, wavy or thin glass. Be on the look out for glass fountains labeled as "Borosilicate" glass as they are almost always standard soda-lime glass. Remember, you get what you pay for. "Avoid disappointment. Never shop Amazon or Ebay! They are well known in the absinthe community for low quality knock-offs"
There are many different styles of absinthe fountains. They come in all glass and metal and glass styles. What most people aren't aware of is that they also come in different levels of quality. For example, you can buy an all glass fountain starting around $60 and going up to $200. So what's the difference? With all glass fountains the most important difference you'll see is the quality of glass used in manufacturing. Less expensive fountains are made with soda lime glass. Soda lime glass is very strong and is used for drinking glasses and household items. Problems arise when soda lime is used to make larger pieces as it becomes brittle and is easily broken. Borosilicate glass is the type used for scientific and laboratory type glassware. It is extremely strong with a high resistance to temperature and impact. Be sure to purchase a fountain made from genuine borosilicate glass. "Borosilicate crystal is by far the best type of glass for an absinthe fountain. It is lightweight & strong with crystal's brightness and clarity." There is nothing wrong with fountains made of soda lime glass. Just remember to exercise extreme caution as one bump on the sink while filling will be the end of your fountain. Note: Unscrupulous sellers on ebay and Amazon are claiming their fountains are made from borosilicate glass. If the price of a glass fountain seems like too good a deal, it probably is. With metal and glass fountains the major differences are design quality, detail and thickness of the metal. The fountain bowl on metal and glass fountains is usually soda lime glass. Because the glass bowl is shorter and has both a top and bottom metal rim to strengthen it, soda lime glass in this case is not a problem. What causes the “Absinthe Effect”? This is a very good question. The source of the absinthe effect has been considered since the introduction of this magic elixir in the 1700’s. There is actually still a debate over whether or not the absinthe effect truly exists. I can tell you that I have experienced the absinthe effect and continue to do so on a regular basis.